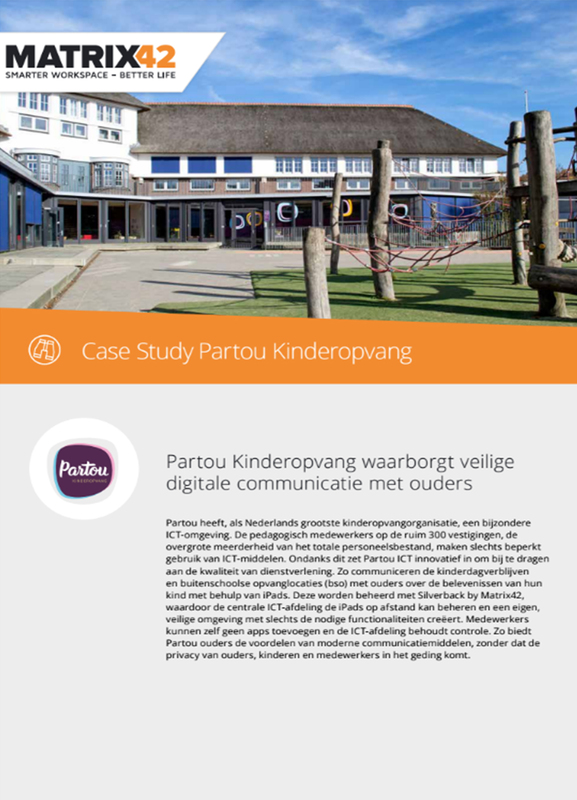 As the largest childcare provider in the Netherlands, Partou has a rather special ICT environment. Although the educational staff at our 300-plus sites, who represent the overwhelming majority of our total staff, make only limited use of ICT tools, Partou has adopted an innovative pproach to ICT to increase the quality of our services even further. Our daycare centers and out-of-school care (OOSC) centers now use iPads to share children’s experiences with their parents. These devices are managed via Silverback by Matrix42, a solution that allows the central ICT department to manage the iPads remotely and create a customized, safe environment comprising only the essential functionalities. Staff cannot add their own apps, and the ICT department retains control. Partou thereby offers parents the advantages of modern communication tools without endangering the privacy of parents, children, or staff.